Winter is a great time to start planning your pool, so you’re ready for the upcoming summer. Careful consideration should be taken when embarking on the endeavour of purchasing your first pool. After all, it’s quite a big purchase and the last thing you want to have is negative cognitive dissonance. There are some options to be mindful of such as in ground, above ground, saltwater, freshwater, lap pool, infinity pool and many more things to try and wrap your head around. In this post we will try and shed some light on all these terms so that you can make an educated purchase. 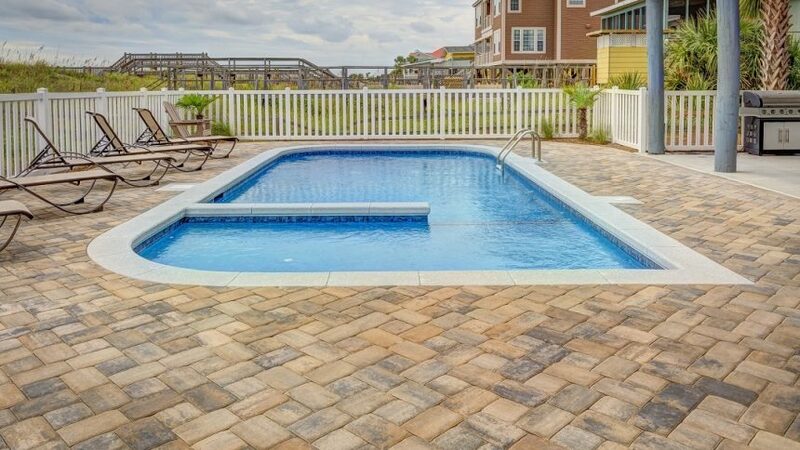 Above ground pools are basically your entry-level foray into the world of pool ownership. They have progressed a lot in recent years and can look quite nice with wooden decking built up around them. They cost a lot less than in-ground pools and allow the owners to take the pool with them when they have to move. In-ground pools, as the name suggests, are built into the ground and sit almost flush with the ground. They come in many shapes and sizes and can also be custom built according to the specifications of the customer. An in-ground pool is a permanent fixture in your backyard and is more expensive than above ground pools. Infinity pools or negative edge pools are usually custom built to highlight a magnificent view. For example, the edge of your backyard looks over a river or mountain. The infinity pool gives the appearance of the water dropping directly over the edge. They look amazing but can be a little costlier than other pools. A lap pool is typically installed for exercise purposes, although they can also double as a recreational pool. They are long and rectangular and generally over 50ft long. They are ideal for the health-conscious family. Natural pools are my absolute favourite. They are of usually of freeform design and feature aquatic plants that act as natural filtering systems. They are usually lined with rubber and are fully equipped with aquatic landscaping zones. A saltwater pool uses a salt chlorine generator to ensure the water is safe to swim. The water is softer on the skin and hair and uses fewer chemicals than your typical chlorinated pool. They can be a little more expensive due to the cost of the salt chlorine generator, and then its cell needs to be replaced typically every 3-5 years – although the results are worth it. Chlorinated pools use chlorine to sanitise the water. It’s a cheaper way to keep your pool sanitary and requires less maintenance and upkeep than saltwater. It’s best to discuss options to see which style of pool will be suited to your lifestyles and needs. Where to Put Your Pool? Generally, I would put a pool up against a boundary to maximise your backyard real estate. By putting the pool up against a boundary you are making use of space that is usually unusable and hopefully, you have more room to set up an entertainment area around your pool. There are generally two sorts of pool decking. First, you have timber which looks great although does require more maintenance than natural stone but can be a lot cheaper. Natural stone decking is a great option for the surrounds of your pool. Natural stone such as limestone, marble, slate, and travertine tiles are used to pave around your pool and are functional due to their non-slip surface. You can create beautiful natural looking poolscapes that feel like you’ve stepped out into a natural swimming hole. Browse online and check out the some of the amazing results people have achieved using slate and other natural stones. No pool area would be complete without some carefully placed lighting to really generate mood and atmosphere. There are some LED products on the market that can be controlled via an app from your smartphone. Welcome to the future! They can be set to a schedule to turn on and off as day becomes night. You can even control the colours of the bulb. When lighting your pool area, less is more. Try not to go overboard, as it can look tacky. Pool fencing comes in a variety of styles. From your traditional pool fencing to glass balustrades. Glass balustrades look the best and provide unfettered views into your pool making them ideal if you want to keep an eye on the little ones. They are more expensive than traditional styles of fencing but often worth it. So there’s a lot to consider when it comes time to purchasing a pool. It’s best to get a basic idea of what kind of pool you want and where you want to put it. Then call your local pool contractor and discuss options that will suit your needs and budget.